Brazilian low-cost carrier Azul is on track to add more than 20 destinations and more than 20 aircraft in 2011, making it by some measures the fastest growing airline in the world. Rapid growth, fuelled by the booming Brazilian economy as well as market stimulation, is expected to continue through at least 2014, at which point Azul plans to have a fleet of almost 130 aircraft. Azul, which launched services in 2008 with a pair of E190s operating two routes, started 2011 with 28 destinations and a fleet of 26 E190/195s. Through the first four months of the year it added seven destinations, three E195s and its first five ATR 72 turboprops. 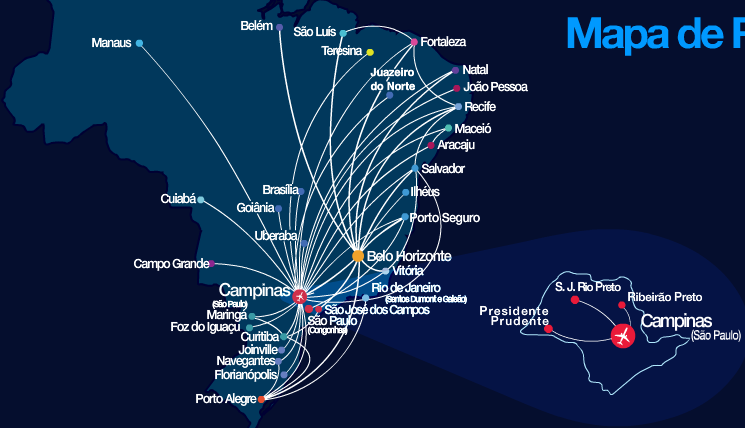 Azul is placing into service one more E195 in May-2011 and in June-2011 will launch four new destinations (Juazeiro do Norte, Palmas, Araçatuba and Marília). As a result, Azul will end 1H2011 with 39 destinations and at least 35 aircraft. Even faster growth is planned for 2H2011. Azul plans to launch services to about 11 destinations in 2H2011, giving it an even 50 by year-end. The carrier is committed to adding a total of 12 E195s this year, resulting in an E-jet fleet of 10 E190s and 28 E195s by the end of 2011. Azul says it is also now looking to lease two or three more second-hand ATR 72-200s, giving it a fleet of seven to eight ATR 72-200s before it begins to take new ATR 72-600s. Azul expects to begin taking ATR 72-600s sometime during 2H2011 but has not yet been provided an exact delivery date from ATR and has not yet been told how many it will be able to take by year-end. The ATR 72-600 is a brand new type slated to enter service in mid-2011 with launch customer Royal Air Maroc. 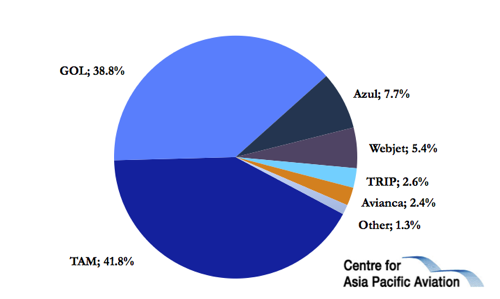 Azul’s original business plan only envisioned 25 destinations by the end of its third year (Dec-2011) and initially only included jets. But the carrier’s management team, led by founder, chairman and ex-JetBlue CEO David Neeleman and president Pedro Janot, has decided several times to accelerate network and fleet growth to take advantage of market opportunities created in part by the faster than expected growth of Brazil’s economy. As a result, Azul placed orders for 20 ATR 72-600s and five additional E195s at the Jul-2010 Farnborough air show. The five additional E195s were all brought into the fleet in 2H2011 and used to accelerate network growth. The five-aircraft order was on top of an initial order placed in Mar-2008 for five E190s and 31 E195s, which Azul subsequently supplemented by leasing five E190s that were used to accelerate its launch of services and initial expansion. The last of the 36 firmly ordered E195s are now slated to be delivered next year but Azul holds options and purchase rights for another 40 E195s. Azul anticipates exercising all these options as part of a fleet plan that envisions 86 E190/195s by the end of 2014. 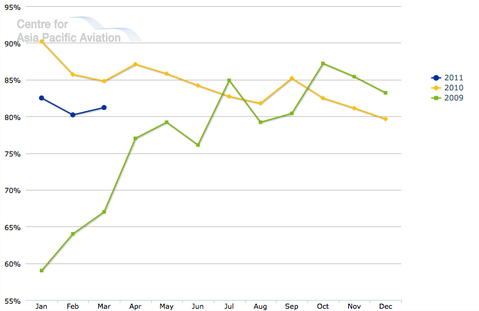 For at least the foreseeable future Azul plans to continue steadily adding E195s at a clip that averages one every month. The ATR 72s are envisioned as a smaller sub-fleet that will be used on short and thin sectors connecting regional destinations with Azul’s hub at Campinas outside Sao Paulo and other large Brazilian cities. But the turboprop fleet is expected to grow well beyond the initial 20 aircraft ordered given the rapid economic growth now occurring in some of Brazil’s second-tier cities. Azul initially identified 40 potential destinations for turboprop flights. These are all small yet fast growing cities with populations of at least 500,000. Some of these are already served by Brazilian regional carriers such as TRIP or TAM subsidiary Pantanal but several others currently do not have any commercial air service. Azul initially planned to begin its regional expansion phase in 2H2011, when the first batch of new ATR 72-600s will be delivered. But early this year it decided to accelerate this phase of its network expansion by bringing in three second-hand ATR 72-200s on leases. These were used to launch services in Mar-2011 and Apr-2011 on three very short routes within Sao Paulo state (Campinas to São José do Rio Preto, Presidente Prudente and Ribeirão Preto) and a slightly longer route from Campinas to Uberaba in Minas Gerais state. Another two ATR 72-200 leases were subsequently added, further accelerating expansion of the new regional network, including the planned June-2011 launch of flights from Campinas to Araçatuba in Sao Paulo state. Azul is now looking for two to three additional ATR 72-200s. Along with the 20 firm aircraft, Azul holds options for 20 additional new ATR 72-600s. The carrier’s medium-term fleet plan has all these options being exercised, giving it a fleet of at least 40 ATR 72-600s by the end of 2014. Azul may also continue to operate some of its ATR 72-200s for the medium-term although it is envisioned these aircraft will eventually be returned and replaced with the new-generation ATR 72-600s. Azul so far has not had any problems filling the extra seats created by its accelerated fleet expansion. Azul has been able to steadily post significantly higher load factors than the Brazilian industry average since shortly after launching services. In 2009, Azul had an average load factor for the year of 75.4%, beating the industry average of 65.8%. In 2010, Azul posted an average load factor of 79.6% while the industry average load factor improved to 68.8%. For 1Q2011, Azul’s load factor remained impressive at 81.1%, again 10 percentage points above the industry average of 71.1%, as RPKs were up 82.8%. Azul in 2010 captured 6.1% of Brazil’s domestic market (based on RPKs tallied by Brazil’s ANAC), making it already Brazil’s third largest carrier after Gol and TAM. In 1Q2011, Azul’s share of Brazil’s domestic market reached 7.8%. While it has already overtaken low-cost carrier Webjet, Azul is still well behind Gol and TAM – which each now control roughly 40% of Brazil’s domestic market. But Azul is expected to steadily eat into this market share over the next three years and could be almost as large as Gol and TAM by the end of 2014. Gol and TAM both now operate approximately 80 narrowbody aircraft in the domestic market. At almost 140 aircraft by the end of 2014, Azul will likely have a larger domestic fleet. But capacity wise Gol and TAM will likely still be bigger because they operate larger aircraft and also plan to continue to expand their fleets albeit at not nearly as fast a clip as Azul. Azul passed the 8 million passenger milestone in Apr-2011, only two months after passing the 7 million passenger milestone. The carrier transported about 2 million passengers in 2009 and about 4 million passengers in 2010. 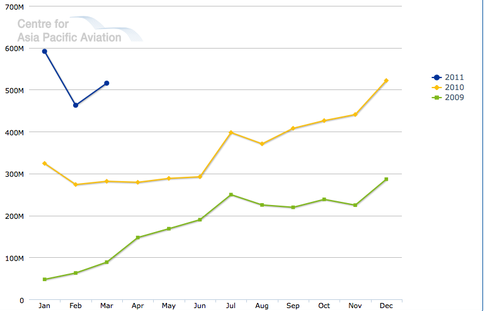 To date flights to and from Campinas have accounted for roughly 80% of Azul’s traffic. At Campinas, where it has faced expansion from other Brazilian carriers, Azul now accounts for 70% of all passenger traffic. Azul now serves 32 destinations from Campinas but also has been growing its point-to-point network, including more than 10 routes at Belo Horizonte. *Service to Juazeiro do Norte, Palmas, Araçatuba and Marília to be launched in Jun-2011. Azul competes on several routes with legacy carrier TAM, regional carrier TRIP and the country’s other two low-cost carriers – Gol and Webjet. But Azul’s business plan from the beginning has focused on developing new markets which were previously not served. Mr Neeleman was confident Azul could find its own niche within the vast and fast-expanding Brazilian market by offering lower fares and operating smaller aircraft than Gol, TAM or Webjet. At Campinas (Viracopos airport), Azul has competition on less than half its routes. Overall the Brazilian market has been red hot, driven by the country’s high rate of GDP growth. Total Brazilian domestic traffic was up 16.9% in 1Q2011, with Azul accounting for roughly one-quarter of the additional RPKs flown. This follows industry RPK growth of 23.5% in 2010, including the 103.5% growth recorded by Azul. Brazil’s current growth spurt began in mid-2009. The country’s domestic airline market has since been steadily recording monthly year-over-year gains well into the double digits, making it by most accounts the world’s fastest growing market. 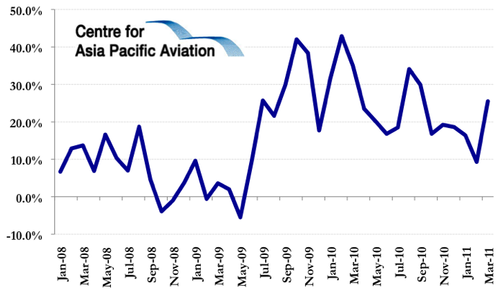 Dec-2008, which was in the middle of the global recession, would seem like an inopportune time to launch an airline. But for Azul the timing couldn’t have been better given Brazil’s economy resumed healthy growth in 2009 and the country’s amazing appetite for more capacity. Azul’s low fares strategy, which from the beginning was designed to appeal to a sector of the population that traditionally has travelled by bus, also deserves some credit for helping drive the spectacular growth. Azul has targetted this sector by creating a category of low unrestricted fares for passengers booking 30 days in advance – a fare category while common in most of the world’s major markets had not existed in Brazil. Azul’s studies indicated that in its first year of operation as many as 85% of its passengers had never flown before. This figure is likely now lower as some of its first time fliers have made air travel part of their annual or semi-annual routine. The combination of Brazil’s growing economy, which has created a larger middle class, and market stimulation created by Azul’s lower fares have resulted in a much larger segment of the population flying. Some competitors have complained that Azul has only been able to stimulate the market and achieve unusually high load factors by offering unsustainably low fares. But Azul is confident its low fares are sustainable and it will be steadily profitable once its operation reaches a certain size and can start enjoying significant economies of scale. Azul does not publish financials as it’s a privately held company owned by a mix of Brazilian and US investors, including Mr Neeleman. But it is believed Azul is already in the black and Mr Neeleman, who took JetBlue public three years after establishing the airline, has stated an IPO is also envisioned eventually for Azul. Azul, which means blue in Portuguese, largely follows the business model Mr Neeleman created for JetBlue, with complimentary drinks and snacks and television screens at every seat. Azul, thanks to Mr Neeleman, already has a relatively high profile in the global airline industry although it is not a member of IATA or Latin American airline association ALTA and does have any footprint outside Brazil. In fact Mr Neeleman has said that Azul has no plans to operate scheduled international flights, although it occasionally operates charter flights to Argentina, as he sees better and nearly unlimited opportunities in the domestic market.